Your sink is truly the focal point of your kitchen, and it can either compliment it in the best way or just be “a sink.” When you are choosing the right sink for your home, think of Franke. They have specially designed some of the most desired kitchen appliances in the world. Their array of distinctive sinks has something for everyone’s sense of style. Let Franke help you show off your personal style and give your kitchen an upgrade to give it the “wow” factor. The Franke Studio STX 621-E stainless steel sink insert is a beautiful, stylish, and modern addition that can give your kitchen more character. 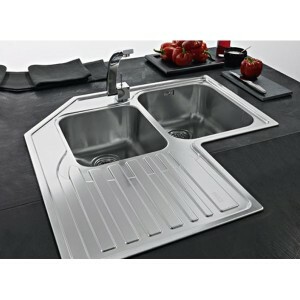 This is one of Franke’s newest additions to their large selection. The Studio STX is a corner design that can offer a practical corner solution to provide you with more counter workspace. This sink is designed with a two bowl setup and has a drying area that can also be used for food preparation. It is made of nickel steel and has a luxurious stainless steel silk finish. This added touch of elegance is not only beautiful, but is stain, rust and corrosion resistant, ensuring that you can enjoy your investment for many years to come. Also, the slim-top profile sits flat on any counter. The slim-top fit inhibits any fluids or food from getting caught in any gaps keeping your kitchen cleaner than ever before. Beautiful and hygienic… it doesn’t get much better than this. Take a moment and think about which appliance you use most often in your kitchen. Most people respond that it is their kitchen sink. It is the center of your kitchen. It is one of the only appliances that you use for food preparation, cooking, and cleaning up after. 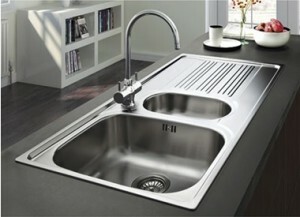 It is essential to have a functional sink that meets your needs, and allows you to balance style and function. Enhance your kitchen’s character and show off your style expertise by installing a Franke Erica 1.5 Bowl EUX 651 Stainless Steel Inset Sink. This sink is the perfect addition to your already flawless kitchen. 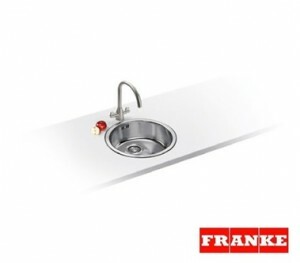 Franke sinks and other products are designed with precision Swiss engineering technology and made with an impeccable level of craftsmanship. The Erica sink is made of nickel steel, which is resistant to stain, rust, and corrosion, ensuring that your sink is like new for many years to come. The Erica also has a stunning shiny sink finish. It is designed with a large deep basin, a smaller basin in the middle for a garbage disposal and small projects, and a convenient workspace. This inset sink is compatible with a countertop and has a Swiss edge profile, which means it has a built-in water protection seal. This quality crafted Erica sink will add a dazzling aesthetic appeal to your kitchen. It is often said that the kitchen is the heart of a home. You want your kitchen sink to be a reflection of your style, while still maintaining functionality and durability of daily use for many years. Kitchen sinks are available in many shapes and sizes and choosing the right one for your home can be an overwhelming process considering the extensive array of choices. You will have your new sink for many years to come, so you will want the right knowledge to choose carefully. Whether you are designing a kitchen for a new home, doing a kitchen remodel or just want to replace your old sink to a more modern and stylish option, WaterFilterShop.co.uk has just what you are looking for. We carry an extensive variety and styles of sinks ranging from ceramic, composite & granite, to the ever-popular stainless steel manufactured by Franke. Kitchen sinks come in a variety of different sizes, shapes, and materials as well as different installation types. You must also determine what your usage will be. To help you, we have provided some helpful tips below on how you can choose the right sink for your home. 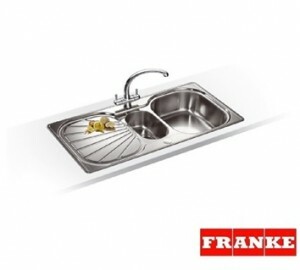 Franke has a long history of creating and manufacturing the world’s most popular and finest quality kitchen sinks. 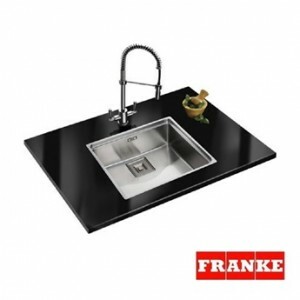 Whether you are searching for the most cutting edge design of would like to keep your kitchen more traditional, you can be confident that when you purchase a Franke sink, you are receiving a high quality product with premium features. If you are seeking to give your kitchen some character and a stylish and modern touch, The Franke Rotondo RNX 610 stainless steel inset sink, is just what you are looking for. It is made from the finest quality chrome nickel stainless steel with a stunning silk finish. While designed to look beautiful, this sink is designed to perfection to be resistant to staining, chipping, rust, and corrosion and help you maintain a clean and hygienic kitchen. There is a reason stainless steel is one of the most popular materials used. It will never break, chip, or flake and offers durability that keeps it looking like new for years. Your home deserves a sink that is crafted to withstand years of daily use without looking outdated or distressed. A kitchen sink is not just a sink anymore. They have become an important design element in kitchen’s everywhere. Franke is known for using high grade materials to create innovative designs with cutting edge style, without ever compromising on quality. The exceptional Centinox CEX 210 stainless steel inset sink is an elegant single bowl sink that is a beautiful and modern complement to any kitchen. The right sink insert and kitchen tap can transform your kitchen from “just a kitchen” to a contemporary atmosphere that you will enjoy every moment. Made with precision engineering, elegance and style the Centinox sink is a practical and truly something new in the world of sink technology. At a first glace you will notice the stylish modern look, and the distinctive stainless steel finish. When you look a little closer you will see that it is fabricated from nickel steel that makes it rust, stain, and corrosion resistant. You will also notice that is sleek design perfectly fits so that the edge of the sink is flush with your countertop. This amazing product would not be complete without accessories, so it also comes with 3 tiered interlocking accessories including a stainless steel strainer bowl, double sided food preparation tray and a Rollermat with square rods and a basket strainer waste and patented hygienic overflow. These accessories cater to the users every need and are created specifically for the Centinox for optimized functionality.